For years, Under Armour Inc. (NYSE: UA) (NYSE: UAA) was a dynamic, high-growth story and an investing super-success. But over the past couple of years, growth has stalled, and the company was caught flat-footed with a bloated operating structure that was built to support a far-bigger company. Add in some struggles to quickly respond and adapt to the changes in the retail landscape in North America, and it has been a tough 18 months for Under Armour shareholders. But with the release of the fiscal 2017 fourth-quarter and full-year earnings results on Feb. 13, the company may have shown not only that the worst should be over, but that it also has a path back to profitable growth ahead of it. Let’s take a closer look at the results, as well as the three most important things from the earnings report and call with management. While it was a far cry from the regular double-digit growth the company had reported every quarter for more than five years, Under Armour did return to growth in the fourth quarter. Sales were $1.37 billion, a 5% jump year over year. It’s hard to overstate how important this was for the company, which stunned investors when it reported a 5% revenue decline in the third quarter. This reversal has been very well received among investors, with Under Armour’s stock price up more than 22% in the two trading days since earnings was announced. There were a few things that played a role in the company’s sales growth. First, international sales continue to expand rapidly. In the fourth quarter, international revenue was up 47%, with sales accelerating in all three major international markets from the prior quarter. 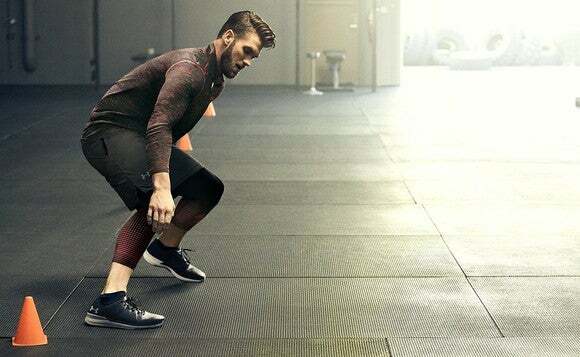 At the same time, Under Armour’s North American sales showed a little stabilization, declining 4% in the fourth quarter, after a terrible 11% decline in the third quarter. Something that’s helping Under Armour in this regard is its efforts to grow direct sales. The company finished 2017 with direct sales making up 35% of revenues, versus 30% of sales in 2016. It was a very strong 42% of total sales in the fourth quarter. That’s not to say the company is moving away from wholesale customers. To the contrary, the company’s success will be tied to its ability to both leverage existing and traditional retail channels (its wholesale customers) while also operating its own retail and e-commerce business. Heading into 2018, the company has expanded its restructuring plans and will spend $110 million to $130 million this year, primarily in facility, lease, and contract terminations. The combined 2017 and 2018 restructuring efforts should reduce annual expensed by “at least” $75 million starting in 2019. In short, it’s going to be at least another year before we see the full operating-cost benefits of the company’s restructuring. In the 2018 outlook and on the earnings call, management continues to have relatively low expectations for North America. Demand is still weak, and the changes in the retail landscape continue to weigh on Under Armour’s wholesale results here. The company is expecting a mid-single-digit decline in North American sales again this year as the competitive landscape continues to play out. But with sales at home still making up more than 75% of revenue, the company is more focused on driving better bottom-line results, versus fighting for growth in a market that’s expected to contract in the short term. Instead of trying to flood the market with product in an attempt to take share, management is instead taking this as an opportunity to optimize its distribution and not just expand it. The company has spent much of the past year dealing with excess inventory it has had to move through discount partners and its own outlet stores, something that’s weighed on gross margin and is expected to continue to do so in the first half of 2018. The company isn’t slowing down its efforts to expand globally, however. Under Armour plans to continue expanding both its direct-to-consumer and wholesale distribution businesses around the world in 2018, with guidance for 25%-plus international sales growth in 2018. For the full year, Under Armour’s guidance is for sales growth in the low-single-digit range, and for operating income of $20 million to $30 million in a GAAP basis, and adjusted operating income of $130 million to $160 million, relatively close to the 2017 result. Management expects gross margin of 45.5%, a small 50-basis-point increase from last year. These goals may not be much to write home about for investors who’ve seen the company grow sales from $500 million a decade ago to $5 billion last year, but based on the market’s reaction since earnings, the company’s bar seems to be pretty low for now. Frankly, investors would probably do well to continue keeping their expectations in check, while watching closely for evidence that Under Armour’s restructuring efforts are starting to pay off on the bottom line. It’s still early in the turnaround, and there’s a lot of work yet to do. David and Tom just revealed what they believe are the 10 best stocks for investors to buy right now… and Under Armour (A Shares) wasn’t one of them! That’s right — they think these 10 stocks are even better buys. Jason Hall owns shares of Under Armour (A Shares) and Under Armour (C Shares). The Motley Fool owns shares of and recommends Under Armour (A Shares) and Under Armour (C Shares). The Motley Fool has a disclosure policy . Earnings Outlook: Under Armour earnings: Is an oversupply of merchandise hurting the brand?